Call us old fashioned, but we don’t like to outsource our choice of restaurants to trip advisor. So, we contacted a friend who’s a bon vivant to ask whether he could recommend a good place for lunch near Vila do Conde. “Make reservations at Romando,” he said without hesitating. “It’s been around forever, serving great traditional food.” We duly called the restaurant and drove to the address they gave us. We arrived at a brand-new building decorated with modern furniture. Could this be the right place? As soon as the first course arrived–robalo (sea bass) with shrimp rice–we knew that we were indeed at the right place. The fish had been filleted and cooked in the oven seasoned only with salt and olive oil. It is a simple preparation, but the timing has to be precise in order for the freshness of the fish to sing. And sing it did, joined by a choir of shrimps wrapped in sea aromas and rice grains dressed in tomato robes. Next, our waiter brought us codfish cooked with red pepper, onion, and diced prosciutto. It was deeply satisfying with all the great ingredients pulling together to make the overall taste much more than the sum of the individual flavors. Finally, we tried some tender, succulent grilled meats accompanied by crispy French fries and flavorful beans. As far as dessert is concerned, it suffices to say that Romando’s puddings, tarts and cakes tempt the most virtuous souls to indulge in gluttony. Rosa and Armando Pena opened the restaurant soon after they got married, more than a quarter of century ago. Rosa was in charge of the kitchen and Armando managed the dining room. They combined their names and called the place Romando. The restaurant quickly gathered fame. But the secret of their success is that they never rested on their laurels. They kept evolving, searching for better ingredients, upgrading the quality of the service and, more recently, renovating the restaurant premises. At the same time, the cooking stayed grounded in the techniques of Portuguese cuisine and in the love and commitment that inspired Rosa and Armando to combine their names. Romando is located at Rua da Fonte, nº221 in Árvore near Vila do Conde, tel. 252 641 075. Click here for the restaurant’s web site. 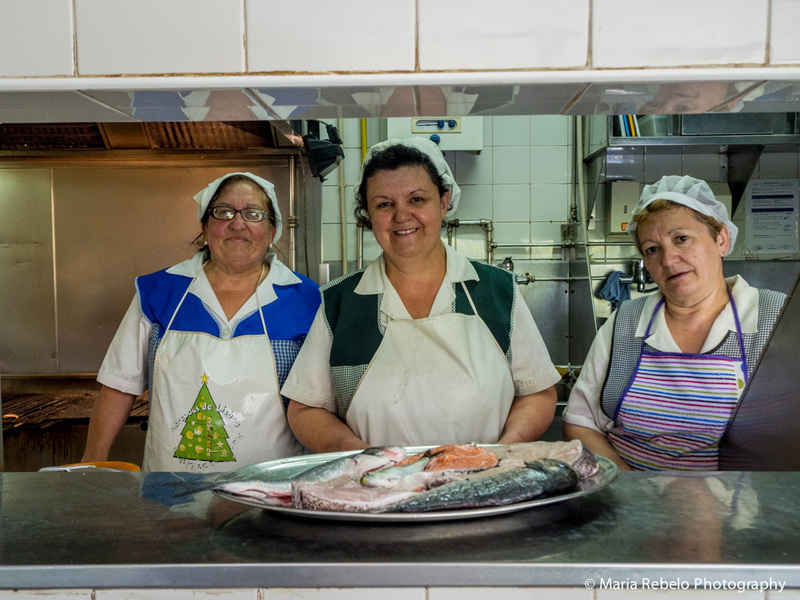 The best place to eat grilled sardines in Lisbon is Casa do Peixe, a modest restaurant on the second floor of the Saldanha food market. This eatery dates back to the first part of the 20th century, when a cook from Galicia came to Lisbon and set up a few tables in the market to serve poached fish. The restaurant quickly became a destination for food lovers. The current owner, Aníbal Sousa, bought the restaurant 30 years ago. When the Saldanha market moved from its graceful old building to its current unremarkable location, he added a charcoal grill and started to grill sardines and other fish. The restaurant is noisy and there is no ambience. But it is always full of locals who love to eat fresh fish, everyone from clerks and shopkeepers to government officials and business executives. Three cooks work nonstop to produce a constant flow of perfectly cooked treasures from the sea. All the fish is great but the sardines are extraordinary; moist and flavorful, grilled to perfection. We asked Aníbal Sousa what makes his sardines so exceptional. He smiled and said: we have been grilling them for many years and we only serve sardines when they are at the peak of their quality. If you’re a foodie in search of the perfect grilled sardine, Casa do Peixe is the place for you. Casa do Peixe is located on Mercado 31 de Janeiro, Rua Engenheiro Vieira da Silva, 135, Saldanha, Lisboa, tel. 213544233.